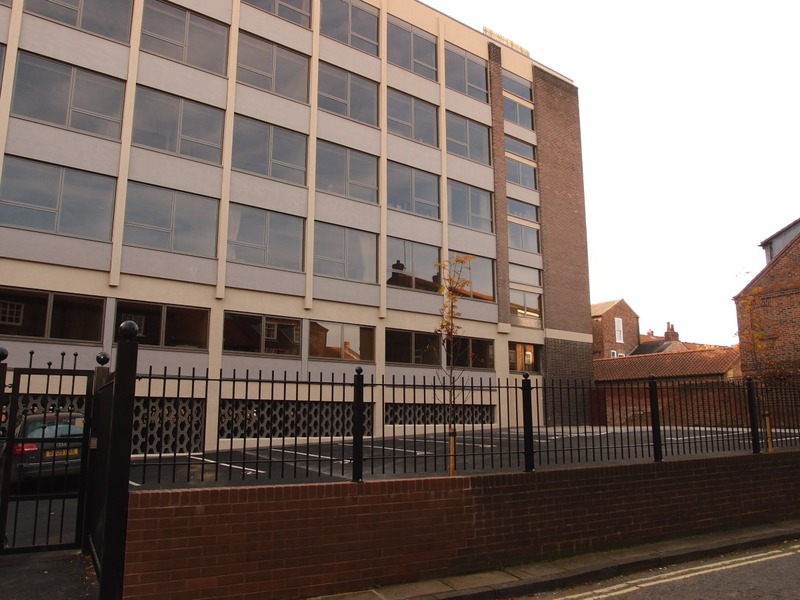 From Stonebow House, let’s pop down the road to revisit another 1960s office block. Back in 2013 I wrote about it, then later several other 20th century office blocks in the city, as it became clear how many were empty and apparently redundant as office buildings. 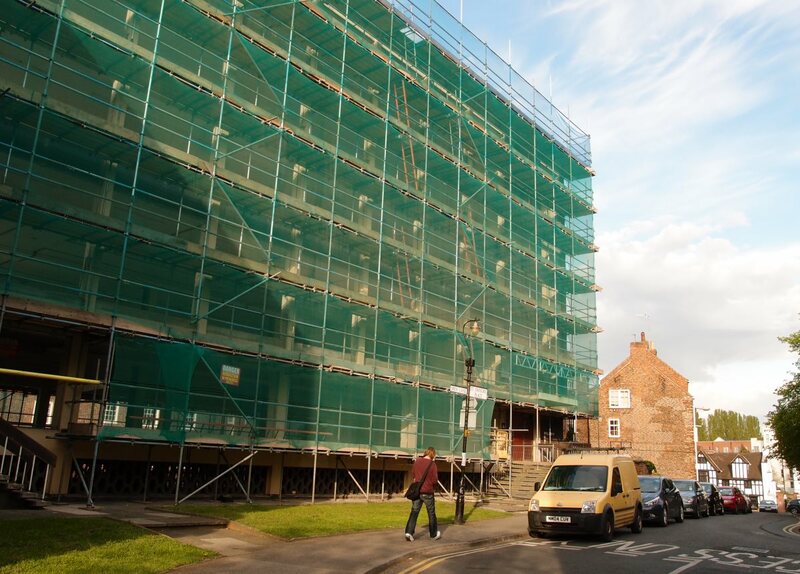 By spring 2014, work had begun to remodel Hilary House into residential accommodation. I wandered past, every now and then, to see how work was progressing. Inside the protective sheeting the building had been stripped right back to its basic structure, just its framework, so the passerby having a nosy through the netting and barriers could see straight through from one side to the other, across what was once a tax office full of people working at desks. 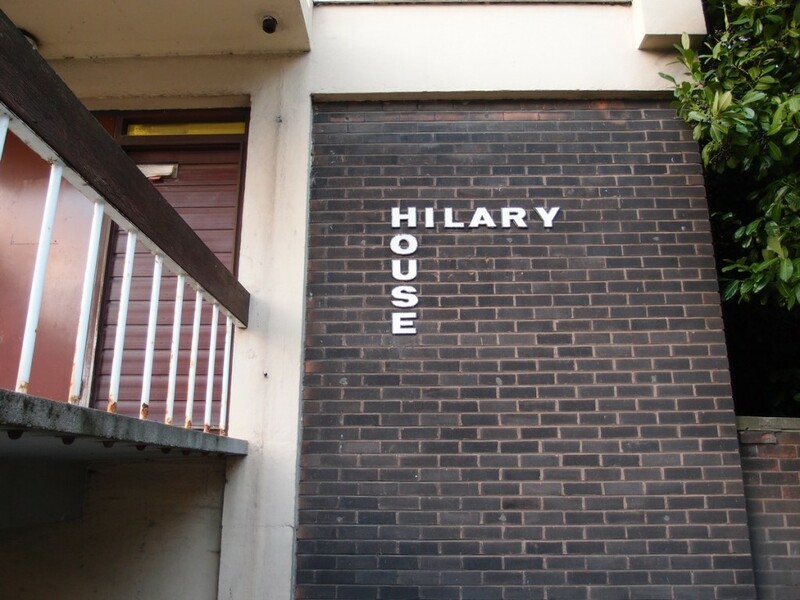 The external appearance of the current building is typical of that time, reflecting the common use of a prefabricated system of construction which in the case of Hilary House consists of a concrete framework and cladding panels. Horizontal bands of glazing lighten the facade, and are framed by brickwork, possibly a concession to neighbouring buildings. 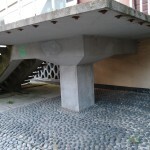 The building which stands today could be seen as a result of the combined effects of current thinking at that time, resulting in a dogmatic approach to the design of buildings. This included a disregard for the use of historical reference in building design, using a palette of materials intrinsic to the design philosophy of the time, irrespective of the buildings context. It’s always good to see buildings being reused rather than demolished. Or I’ve always thought so. 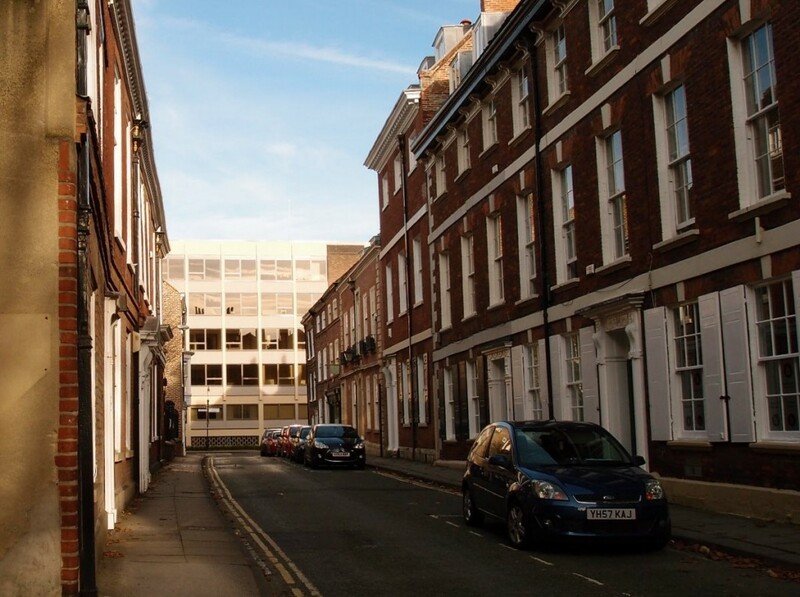 And here in York we’ve seen some interesting and imaginative reusing and remodeling of buildings. Sometimes that’s because they’re listed and historic. This one wasn’t but it was retained anyway. Despite being one of the ‘detractors’ mentioned in council documents and other reports. 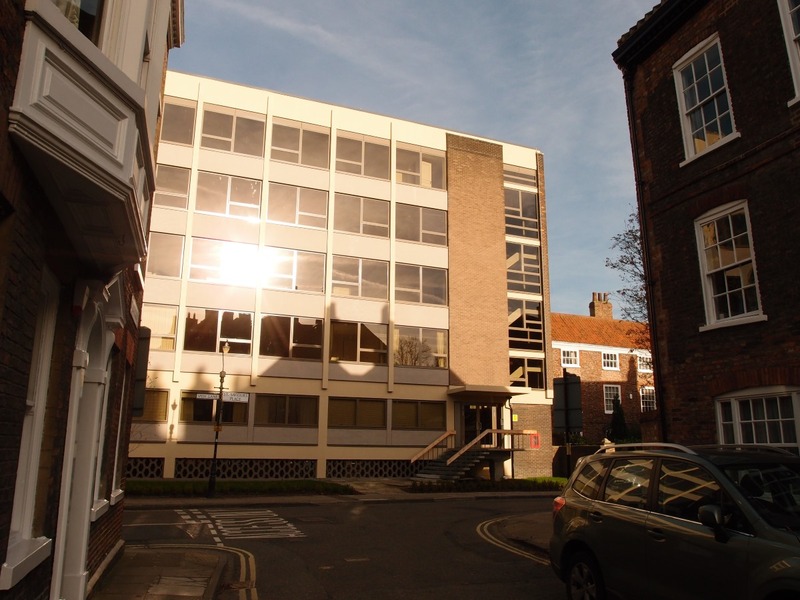 And here it is now, in November 2015, viewed from St Saviourgate. Where you might be forgiven for not noticing much of a change. It’s still big, it’s still noticeably modern compared to the handsome old houses of St Saviourgate. On closer inspection, it has changed quite a bit. Been refaced/reclad, whatever the term is. Whatever, it looks smarter. Round the back, on Aldwark, what was once a rather forlorn and scruffy car park has a new smarter boundary, with railings and gates, and a newly planted tree. 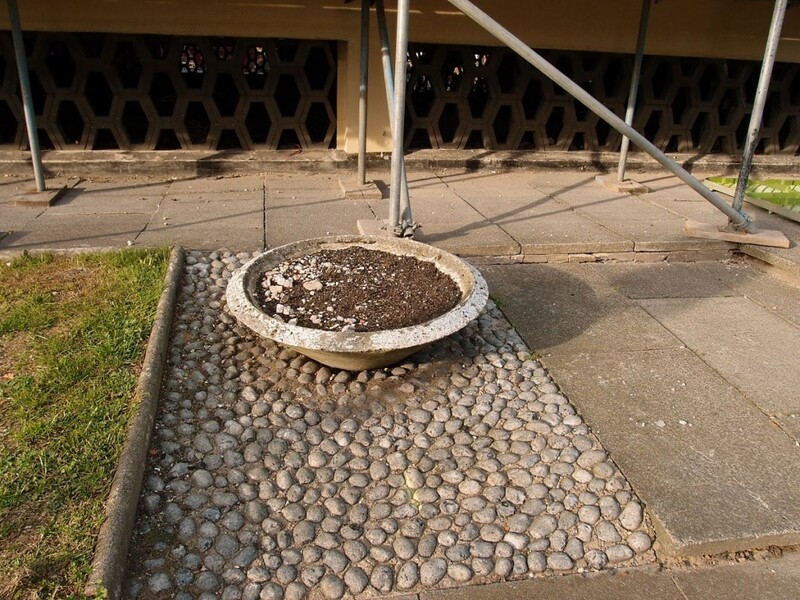 The concrete planter has gone. 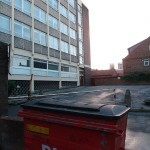 The collection of large wheelie bins once a feature to one side of its rear entrance must have found a new home. 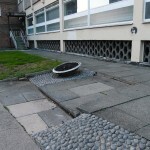 Round the front, it faces the street with a new bit of grass and wood chippings and a small shrub planting near the steps, replacing the empty concrete planter and ‘decorative’ cobbled surface. The changes outside are subtle, but inside it’s really quite posh, by the sound of it. 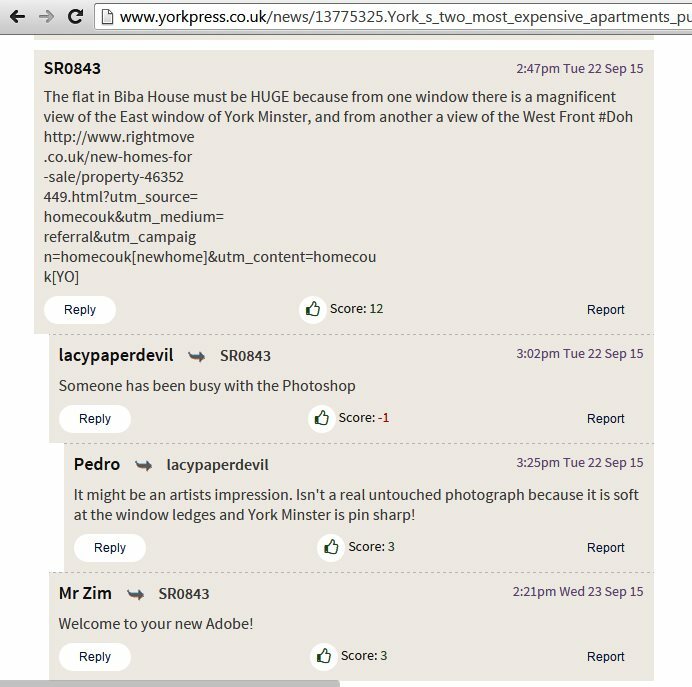 Recent Press articles and the brochure for the building — now called ‘Biba House’ — advertised its grandeur. You can view those via the links below, in ‘Further information’. The top floor in particular has impressive views, shown in the publicity for the development. And as one comment on the Press website pointed out, the place must be even bigger than we thought it was, as according to the images in the brochure, one of the windows looks out towards the east end of the Minster, while another is shown to look out onto the west end … (provoking a very clever pun on abode/Adobe from another reader). Creative representations aside, it’s interesting to see what can be done with a redundant 1960s office block. Similar things are happening elsewhere, with other office buildings. Reuse of existing structures seems sensible and more sustainable. Far better than demolition, surely, wherever possible? 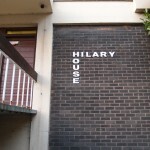 If you’d like to remember the old Hilary House and its architectural details, a small gallery of images follows. If you’re more interested in its recent remodeling, see the links, below. 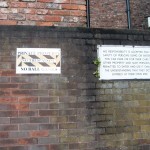 This website, and the page you’ve just read, was made by Lisa @YorkStories. Creating and sustaining this independently produced and ad-free record of York and its changes continues to be a labour of love, and seems more important as the pace of change quickens. If you enjoy it, and value my work, please support this site. 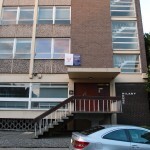 « Stonebow House: still unloved?